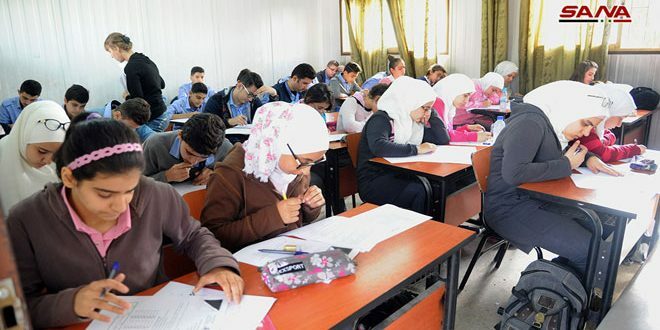 Damascus, SANA- The competitions of the Syrian Science Olympiad 2018-2019 in the subjects of math, physics, chemistry, IT, and natural sciences kicked off at the school level on Thursday with the participation of the 10th grade students from the Syrian provinces. 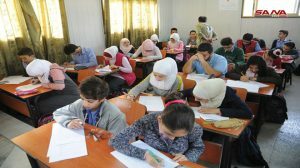 The competitions of the first stage were held for an hour and a half in all provinces, in which every participating student chose one scientific subject as the central scientific committees in the Syrian Science Olympiad put the question forms. The test papers will be corrected by the specialized teachers. Speaking to the journalists following a tour to the competitions’ centres in Damascus, Head of the National Commission for the Syrian Science Olympiad Imad al-Azab said that all the students of the tenth grade from all provinces participated in this season of the Olympiad competitions in order to discover the largest possible number of scientific talents among the Syrian youth. All the necessary facilitations have been provided to the students to achieve the Olympiad competitions in an optimal manner, in cooperation with the Education Ministry, al-Azab said. Al-Azab affirmed that the Commission will go ahead in the efforts to discover the excellent students in the provinces and develop their abilities and skills via scientific competitions, training and the rehabilitating programs, and continental and global participations. A number of students expressed their desire to participate in the current season of the Olympiad competitions to reach advanced positions qualifying them to represent their country in international scientific competitions.